But before I share with you Part One of a recent Live Fix Experiment, I want to thank my friend and fellow music writer Moira McCormick for giving me the chance to test out some ideas and explore another aspect of live music. Last Tuesday, I reviewed Saul Williams and the Afro Punk tour stop when it came to the Double Door. You can check out my review and more of Colleen’s photos here. But I’d like to give Moira’s review center stage because it was her review that made this Dual Review Experiment a success. 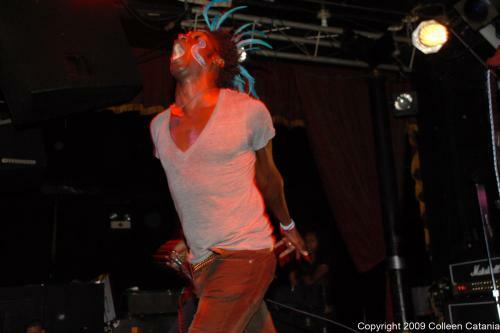 When Saul Williams played Lollapalooza 2008, the multi-hyphenate artist (poet-actor-emcee-activist-writer-avant-rocker) scorched an already sultry Sunday afternoon. His skin-flaying barrage of electro, industrial, rap, and riffage was glandular in its intensity; the fact that it scared off a pair of yammering fratboys to my left made Williams’ startling set that much more delicious. Thus, my question: was the impression that Williams’ Chicago appearance (Tuesday night at the Double Door, as headliner of the Afro-Punk Tour) was just a skosh less gobsmacking due (at least to some degree) to the following: the amiably dank Wicker Park venue’s near-capacity crowd was rather emphatically preppy? If Saul Williams is swelling his own ranks with this brand of mass audience, it’s due in no small part to the brands of two corporate footwear titans: Nike, who made indelible use of Williams’ ferocious punk salvo “List of Demands (Reparations)” in a 2008 ad campaign; and now Converse, sponsor of the multi-city Afro-Punk Tour. It’s large-scale exposure, and it works. Headliner Williams (who was immediately preceded at the Double Door by the workmanlike clatter of Houston-based American Fangs) took the stage calling a litany of names who have influenced him (and his alter ego, Niggy Tardust.) Baldwin, Coltrane, Hendrix, Shakespeare, Marley, and many more were invoked, while the four-piece band Krak Attak – led by drum machinist and Williams’ longtime compatriot CX Kidtronik – loosed a fire-hose spray of large rusty nails. “Too many people to dance?” queried Williams, crowned with turquoise feathers and sizing up the sardined throng in the mosh pit. “No? Prove it!” He lurched into the fury of “Sha-Clack-Clack,” his declaration of incandescence from the 1998 movie Slam, going on to deliver a seething hit parade of signature tunes, including the sinuous “WTF,” jazz-inflected “Black Stacey,” jagged “Surrender (A Second to Think),” and deeply rocking “Tr(n)igger.” All eminently worthy, if (as mentioned) maybe not quite as utterly staggering as Williams’ Lolla set. A handful of new material did intrigue, in particular the piece Williams introduced as “a demo,” all ominous synths oozing between anxious staccato beats. By his performing the work-in-progress, Williams announced to the crowd, “You’re helping me write it.” Also striking was a song so freshly minted Williams described it as “barely written;” it had a loping, psychotic-Asian-cowboy feel – the soundtrack to an Eastern Western, maybe. The show could very easily have done without Kidtronik’s playing-to-the-groundlings antics towards the end, soliciting “the ladies” to dance onstage, but it was followed with a respectable version of “List of Demands” – a crowd-pleasing closer that got the desired response. I learn a lot from reading the work of fellow music writers and this was no different. The areas I bolded were spots where I really zeroed in because Moira’s descriptions were either strikingly different than mine or revealed a side to Williams music that I hadn’t seen before. We had talked about her Lollapalooza 2008 review before the show and I didn’t expect her to use that as a lead. Nonetheless I loved how she used “delicious” as a way to describe her excitement and anticipation Williams show. The other part I loved about doing this Experiment was how it unlocked ways to describe live music. Sometime I get in ruts and when I read reviews like these I walk away inspired and pumped because I feel like I have just added new weapons into my music writing arsenal. Reading her “loosed a fire-hose spray…” and “…soundtrack to an Eastern Western…” descriptions were truly “new weapons” moments. And it’s moments like those that make writing, and reading, about live music so fun and a great creative adventure. Because let’s be honest, writing about music doesn’t always pay the big bucks so there’s got to a be reason why we do it for so long and for so little pay most of the time. One reason, I know, is because when we’re having fun doing it, it’s a highly pleasurable creative outlet and a powerful form of self-expression. And this makes perfect sense because many music writers (me included) are better at writing about music than playing, so it’s only natural that we’d turn to the written word to express ourselves. The other part of this experiment that I loved was the chance to connect and collaborate with a fellow music writer. It’s not to often that I get to meet and work with my colleagues in this way, so this was a great chance to do something fresh with a old craft and build our Live Fix community. I hope you enjoyed Part One and stay tuned for Part Two as I interview Moira about some of her favorite concert experiences as a fan and a music journalist. We had a brief time to chat before the Saul Williams and I’m excited to share the rest of her story with you.